Simon Thacker (classical guitar) has attracted the highest acclaim wherever he has performed, from Scotland to Havana, London to Malta. His technical virtuosity and emotionally charged interpretations have established him as one of Britain's most exciting classical performers. He was recently appointed Visiting Fellow in Music at the University of Aberdeen and nominated for a Royal Philharmonic Society Music Award, the highest recognition for live classical music-making in the UK. 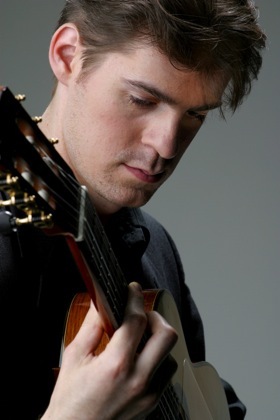 In 2006 he was a winner of the 50th Park Lane Group Young Artist Awards, resulting in his solo Purcell Room debut. The premiere of innovative solo tour programme The Alternative Guitar was acclaimed with a five star review in The Scotsman. Simon has performed in Cuba and recently gave solo perofrmances in Massachusetts, USA, and Andalucía, Spain. He has toured the UK several times and broadcast on Cuban TV and BBC Radio 3. Simon is Head of Guitar at Edinburgh Napier University and founder of acclaimed crossover group Camerata Ritmata. He will be performing in France in 2010 with ¡Canto vivo!, his highly successful duo with soprano Claire Debono. Also see Tune Up podcast: Simon Thacker and the Nava Rasa Ensemble (2009-2010: Episode 2).